This new science toolkit is designed to educate young children about environmental science, and will be distributed to 300 classrooms throughout Ireland. The free educational toolkit was launched during the 2018 Science Week at Scoil Iosef Naofa, Oranmore, Co Galway. 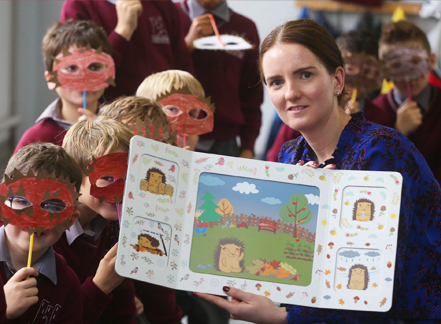 It uses a hedgehog as the principal character, while taking first and second class pupils on an explorative journey to learn about key topics in environmental science. Storytelling, hands-on activities and games are all used to promote active learning, based on observation and experimentation. The content of the toolkit and the activities involved were all reviewed and piloted in Galway by first and second class teachers: Ronan Dunne from Galway Educate Together, Vivienne Kelly from Knocknacara Educate Together, Anna McGuire from Mercy Primary School, and Niamh Cormican from Scoil Iosef Naofa, Oranmore. The exploration box contains a ‘Kamishibai’, this is a form of visual and participatory storytelling that combines the use of hand drawn visuals with the engaging narration of a live presenter. This storytelling theatre means that teachers can take their class through the story of Spikey and help them to understand the key characteristics of living things, the food web and how it functions, habitats and hibernation and the vital role we all play in protecting the living environment. The toolkit has been produced in three languages, and is being supplied to teachers across four European countries as a result of an Erasmus+ European project linking researchers and education practitioners from Ireland, the United Kingdom, Austria and Poland. From January 2019, the toolkit will be distributed nationally to requesting teachers through the Galway Education Centre, as well as education centres located in Donegal, Dublin West, Wexford, Monaghan, Navan, Tralee and Clare.